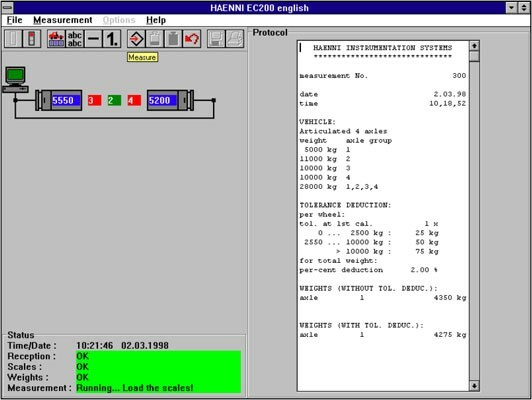 EC 200 is a WINDOWSTM software for the processing of weights of vehicles measured with static or dynamic wheel load scales. The scales are connected to the computer by means of specially designed cables andconnectingboxes. TheCommunicationwiththescalesisviaaserial interface RS 232 or USB. The menu of the EC 200 is used to control the weighing process. Individual texts can be entered or retrieved for each measurement. Overload can be calculated by selecting the appropriate vehicle type from the catalogue. To determine the payload, a deduction for the tare weight can be entered manually, or automatically from the difference of two weighings. An automatic weighing is possible under certain conditions. If necessary, the EC 200 can control traffic lights or barriers, to ensure a correct operation. In addition, selected weight values can be visualised on a long distance display. The operation of the software is self explaining. In addition it is equipped with an on-line help and with clearly understandable comments and error messages. Processing software for the wheel load scales series WL1xx, for measuring wheel loads and calculating axle loads, subtotals as well as total weights of vehicles and airplanes. 2 dynamic weigh sensors WL 110. Automatic zero check after starting the measuring procedure. Editable limits for a unlimited number of vehicle types. The net weight is calculated using the tare weight input or a selectable previously measured weight. Upon key stroke the weighing results are stored and printed out. Binary. Format conversion for further processing with common spread sheet programs. Various formats, selection in the setup. 20 editable text lines, free positioning. 10 additional text lines for comment to the individual measurements. The weighing results may be monitored on the optional remote display. Two relais of the optional switch box may be activated. One is swiched in the case of overweight, the second after the weighing is completed in order to separate the queued vehicles. DDE data exchange ability with other Windows applications. WL 103 by their own batteries or by external supply. WL 104 and interface box by external supply. WL 110 sensors and Interface box via USB, mouse or keyboard port.